CD reviews: "Sing a Song of Seasons" and "This Land Is Your Land"
These reviews first appeared in the May 10, 1997 edition of the American Reporter. Rachel Buchman is a natural storyteller, and she has a well-developed empathy with children. And, unlike, say Raffi, Buchman wears pretty darn well on adult ears, too. No wonder she's a growing favorite for families with small ones. Her latest release, "Sing a Song of Seasons," is a celebration of the seasons, based in large part on the children's poetry of Robert Louis Stevenson. One of the neat things about Buchman is that she uses spoken asides within the songs to communicate directly with your listening rug rats, inserting play-along games to hold their attention. Another of the things that makes Buchman so very special is that she talks to the children, not at them or down to them. Buchman is not possessed of a great voice. But she's an enthused singer, a gifted acoustic guitarist, and wonderful arranger. The most important thing about her new album is that it passed the kid test  Larissa and Christopher, the six-year-old and four-year-old who helped with this review, loved it, daily demanding that "Rachel" be put on as soon as they arrived at home. High praise, that. The late Woody Guthrie is best remembered  and was best known  for his political causes, which his populist music celebrated and advocated. At heart, though, Guthrie was a musician, not a politician. For proof, check out a newly released collection of children's songs Guthrie recorded for his daughter Cathy more than 47 years ago. Lost until recently, the songs on "This Land is Your Land" range from the silly to the charming, with hardly a political note to be heard. Look, whether you agreed with Guthrie's politics or not, you have to admire any father who's willing to be silly to make his child laugh  and what else could the following lyrics be for: "Howdy doozle doodle doozie"? His "Riding in My Car" song is equally silly, with Woody pursing his lips to make motor noises. 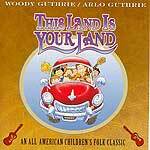 What is advertised as a special treat, son Arlo's duet with Woody (a la Natalie Cole) on "This Land is Your Land," instead is a dud, flat and out of place here. But the rest of the album is wonderful entertainment for the wee ones, who will enjoy singing along to the silly alliterative onomatopoeia lyrics, bouncing to the rhythm, laughing at the stories.